encore +10% aujourd'hui, alors que les métaux et le hui reculent ( FED annonce des taux, demain) . Oui encore 1381% et on sera à 28$, cours de décembre 2010 ... l'espoir fait vivre. Vous le savez Sandro et Marie, et pourtant vous vous accrochez. Pourquoi ? Vendez au moindre rebond et placez vous sur un autre cheval. Il ne faut jamais s'accrocher à ses positions. Peu importe de gagner 1000 € en se rattrapant aux branches sur une position perdante ou bien de gagner 1000 € sur une nouvelle position vierge, c'est TOUJOURS 1000 €. la compagnie annonce suspension production à Velardena mine en raison des prix trop bas de l'or et de l'argent, le prix d'équilibre étant de 1600 $ pour l'or et de 30 $ pour l'argent. par ailleurs, un plan de réduction des dépenses administratives et générales de 25% va être mis en oeuvre. Oui mais ça montre bien que c'est pas demain la veille que ça gagnera de l'argent ! déjà qu'on est mal avec cette action, je te dis pas la cata si Audrey s'en mélait ! on est déjà suffisamment mal lotis comme ça ! This article is about Golden Minerals (AUMN). 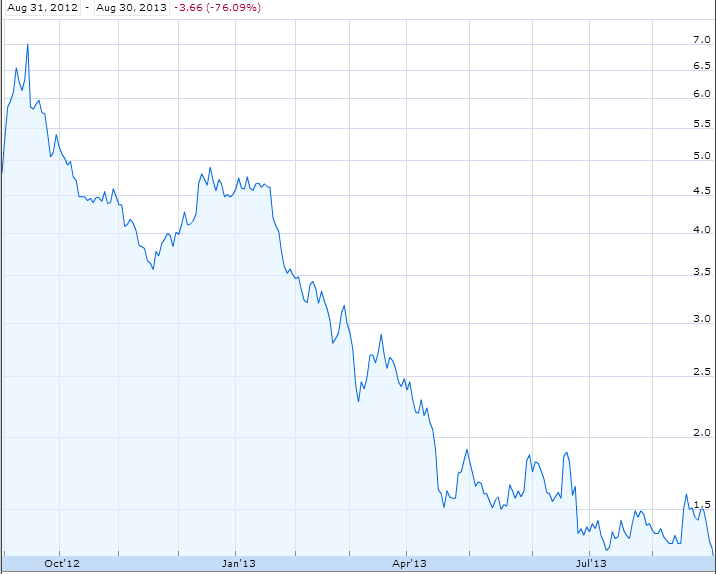 In 2010 - 2011 Golden Minerals was flying high, trading above $20/share at one point. In June of 2011 the company purchased ECU Silver for roughly $300 million, and investors were under the impression that the company had a producing mine at Velardena with over 300 million silver equivalent ounces. However the company's fortunes quickly turned. When it had the Velardena NI 43-101 technical report updated the new results showed that the company had considerably less metal than it initially thought: less than 100 million ounces of silver overall, and about 68 million ounces of silver equivalents at Velardena. Seeing that the company still had ample silver to produce at Velardena the company was still able to produce at an annualized rate of nearly 930,000 silver equivalent ounces. However high production costs and crashing silver and gold prices lead to another blow to the company: it ceased production on June 19th. Now the company has no production, less metal than it initially thought, and a share price of just $1.14, giving it a market capitalization of just $57 million. Furthermore, while other gold and silver mining companies' stocks are rebounding, Golden Minerals'stock currently sits just above its 52 week low. It is not often that one comes across a company with such a sizeable resource base (with the infrastructure in place to produce much of it), a deep exploration pipeline, and a lot of cash and no debt. While Golden Minerals has high production costs at Velardena, it is working aggressively to find ways to lower them. Furthermore, at higher gold and silver prices the company will be able to restart production and generate significant cash flow relative to its current valuation. 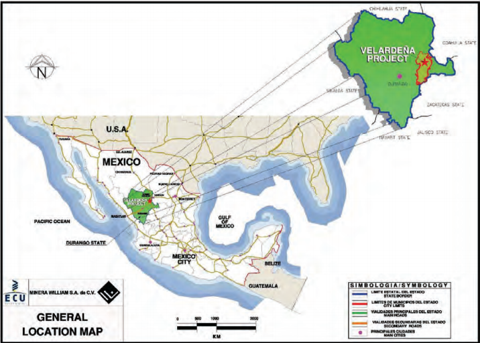 Ultimately, given its pipeline of projects, and its (temporarily suspended) plans to ramp up production at Velardena, the company can potentially grow production to 3 million ounces of silver production a year or more. Golden Minerals has an estimated 92.6 million ounces of silver (46.6 million ounces of measured and indicated resources and 46 million ounces of inferred resources) and 600,000 ounces of gold (300,000 ounces of measured and indicated resources and 300,000 ounces of inferred resources). Velardena is located in Durango, Mexico. The property contains both gold and silver with silver slightly outweighing gold at current market prices. In all it contains an estimated 30.4 million ounces of silver (14.6 million measured and indicated ounces at 195 grams per tonne, and 15.8 million inferred ounces at 159 grams per tonne) and 600,000 ounces of gold (300,000 ounces of measured and indicated gold at 3.46 grams per tonne, and 300,000 ounces of inferred gold at 3.33 grams per tonne). 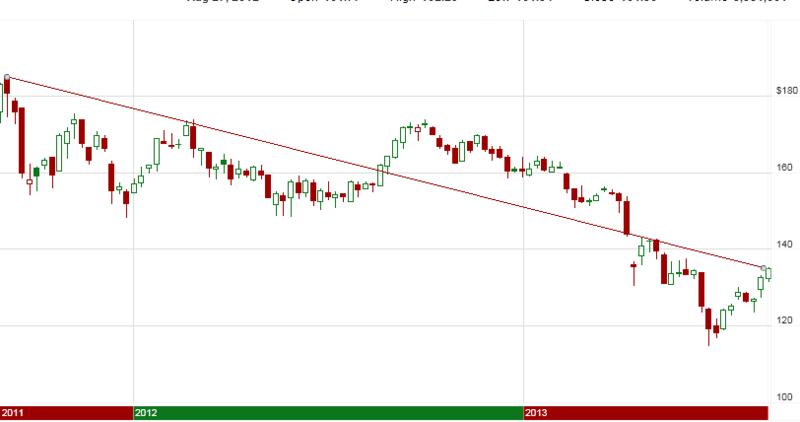 The following chart details this information. Up until a few months ago Velardena was Golden Minerals' only producing mine. In the first half of 2013 it produced 395,000 silver equivalent ounces, but it stopped producing on June 19th due to high production costs that exceeded $35/ounce because the ore is relatively low grade for an underground mine. With the silver price at $24/ounce the mine is simply not economical unless the company can lower production costs. It is finding ways to increase its recovery rate from gold, which fell from 68.7% in the first half of 2012 to just 50.6% in 2013. Whether Golden Minerals can accomplish this or not to a large extent determines the strength of my investment thesis in the company's shares. While the company has other resources--primarily at El Quevar in Argentina--and more than half of its current market capitalization in cash, the risks that investors must take are not complimented with an adequate reward unless Velardena is a potential producer. El Quevar is a potential silver mine located in Argentina. Golden Minerals has done extensive exploration here and has discovered over 60 million ounces of silver resources: 32 million ounces of measured and indicated resources at 141 grams per tonne, and 30.2 million ounces of inferred silver resources at 152 grams per tonne. This information is detailed on the following chart. This is almost certainly enough resources at a high enough grade for a mine. However we still do not know the economics of the project (e.g. how expensive it will be to produce, how expensive it will be to build the mine, and how much silver the company will be able to produce). The project also has a lot of exploration potential, and given the company's [url=http://www.goldenminerals.com/pdfs/drill results/El Quevar/ElQuevar_BestResults_Oct_2010.pdf]drill results[/url] I suspect that it will be able to expand the property's resource estimate, as it has found many expansive holes with grades greater than the 150 grams per tonne of the project's current resource base. 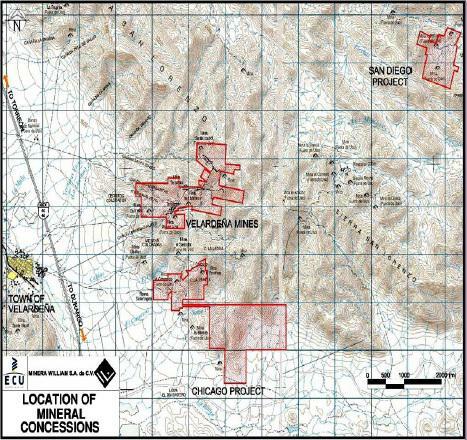 While Golden Minerals owns the property outright, in its corporate presentation, it claims that it is soliciting a partner "to advance project drilling and evaluations." On the one hand this may be a good idea considering that the company has had difficulties over the past year. But if it finds a JV partner this will severely limit the upside potential of the mine once it goes into production. Given the fact that only investors who are very bullish on silver prices should consider taking a position in Golden Minerals (given high production costs at Velardena), I am not sure if such a strategy coincides with the investment goals of Golden Minerals shareholders. 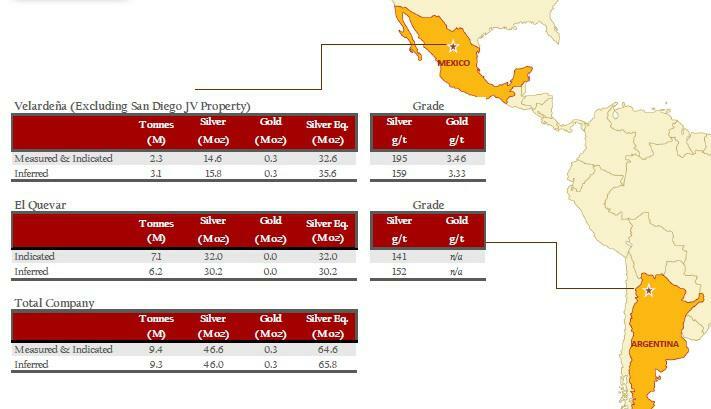 Golden Minerals has a portfolio of roughly 40 exploration properties in Mexico and South America, although it is in the process of selling some of them off to focus on a few key targets. Despite the issues the company has been facing it is still spending $5 million to explore them, although this figure is down from about $20 million last year. None of these properties have any NI 43-101 compliant resources. 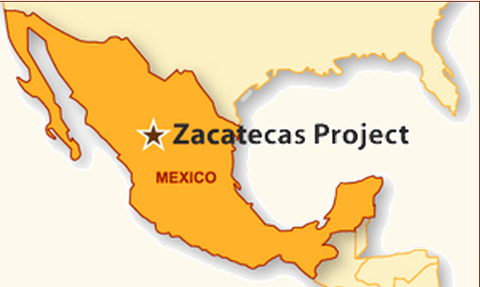 Of particular interest is the Zacatecas project in Mexico. The project has seven targets that the company is focuses on. The Panuco target is of special interest with some drill holes yielding several hundred (1,700 in one case) grams of silver per tonne of ore. This suggests that there is a good possibility that an economically feasible mine is located here, although more exploration needs to take place before this can be determined conclusively. Golden Minerals is worth investing in if you believe that the price of silver will rise substantially. This is evidenced by the company's cash flow potential assuming it brings Velardena back into production when silver and gold prices rise (assuming they do). The company was able to produce the equivalent of 930,000 silver ounces annualized at Velardena, and it has longer term plans to increase production to 1.7 million ounces. If the company is able to carry out its plans reduce production costs (as I outline above) then it can likely bring its costs in line with most other producers, and produce silver equivalent ounces at about $25/ounce. Let us assume that it can get costs down to $30/ounce. The following chart estimates the company's cash flow for 930,000 ounces of production and 1.7 million ounces of production at various silver prices. Based on the assumptions that the company can lower production costs and ramp up production, we see that its shares have enormous potential upside. If you believe that the price of silver will go to $50/ounce, then if we put a 10-multiple on Golden Minerals' cash flow it can trade at $340 million, which is a 6-fold increase. This does not take into consideration the company's cash. It also does not take into consideration its El Quevar property--while this property doesn't have any production guidance, just based on the size of the resource it can potentially produce 1.5 - 2 million ounces annually, which means that Golden Mineral's cash flow would potentially double. While there are several "what ifs" in these figures, it is clear that investors who are bullish on the silver price, and who believe in management's ability to restart production at Velardena will be amply rewarded. 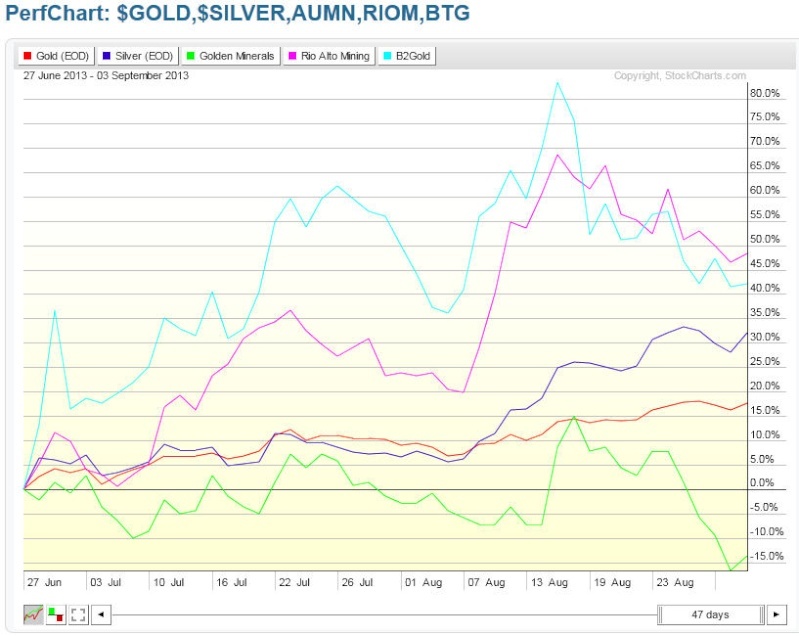 The price of silver has performed terribly over the past two years, having declined from $48/ounce to around $24/ounce. 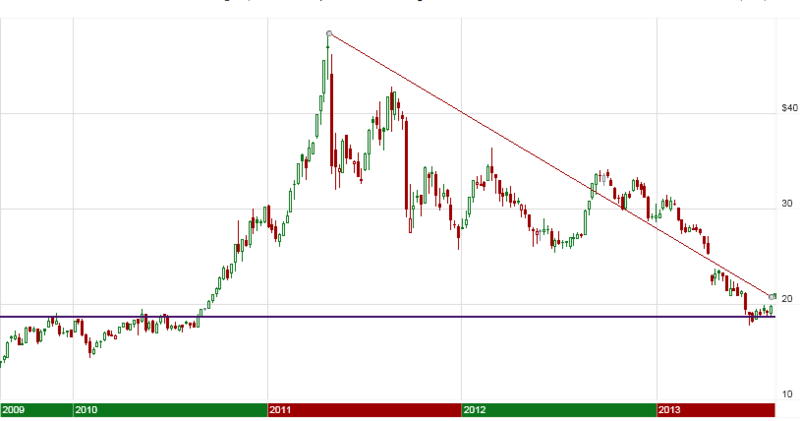 While there is significant technical support at around $18/ounce - $20/ounce the downtrend that began in May 2011 is still intact. Most silver producers cannot, or can barely turn a profit at the current price, including Golden Minerals, and this is a reason that the silver price has likely reached or is near a bottom. The fact that silver has risen over 20% from its $18.61 low is another good sign that this is the case. 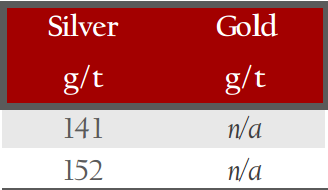 But while most silver producers have break-even points at around the current silver price, or slightly higher, from the company's recent financial figures we have seen that Velardena needs substantially higher prices in order to break even. In the first two quarters of 2013 the company's costs exceeded $30/ounce. Thus investors should not consider taking a position in Golden Minerals unless they believe that the price of silver will rise to a level much higher than $24/ounce. The price of gold has fallen precipitously recently, and nearly half of Golden Minerals' resources at Velardena are gold. So long as this downtrend remains intact, there is a reasonable possibility that the gold price will continue to fall in the short term. 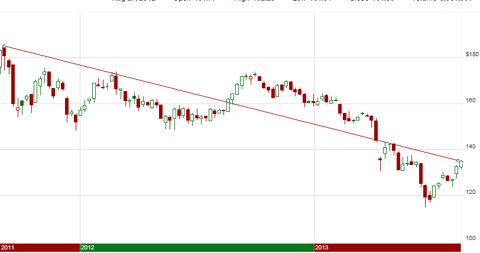 The price seems to have found a bottom around $1,200, which suggests that the downtrend in gold may come to an end. Still, it is intact, and lower gold prices will be reflected in Gold Fields' share price. However, I do not believe that the downtrend will continue, as many gold mining companies cannot make a profit in the current gold price environment. Golden Minerals is just one example. A lower gold price will force companies with unprofitable or marginally profitable projects to shut them down, and this will put significant pressure on future supply. But while gold is barely economical to mine at $1,400/ounce, there is no reason that the price cannot remain at this level for some time. If Golden Minerals cannot lower production costs at Velardena then there will be no point in them producing unless silver and gold trade substantially higher. As the mine sits idle the company may be conserving cash, but it is actively pursuing ways to lower mining costs. It also estimates that it will cost $5.5 million to restart the mine. Furthermore, while the company finds higher grade ore, finds ways to lower administrative expenses, and finds ways to increase its recovery rate for gold, it is losing resources that could be devoted towards exploration and developing El Quevar. Thus for the time being the value of Golden Minerals is deteriorating, even as its resources remain constant. Therefore investors not only have to believe that the price of silver will rise, but that it will rise soon. In this respect Golden Minerals is not unlike an out of the money call option on silver. Mineral reserves, as opposed to resources, have been proven to be economically viable to extract. Golden Minerals only has resources, which means that the value of its estimated resources is less certain. While I don't necessarily advocate that the company spends the money to determine which, if any, of its resources can be counted as reserves, they have a lower value as they stand. Fortunately for Golden Minerals shareholders the shares are so inexpensive that shareholders don't have to think about the possibility that the company is overvalued on a price to resource basis. Golden Minerals exemplifies what can go wrong with a mining company, and ultimately why small mining companies are such risky investments. But I believe that the company was prepared for the worst given that it had a sufficient amount of cash and no debt. Because of management's prudence it was able to survive a drastic reduction in its estimated resources, and a crash in silver and gold prices. While the shares lost more than 90% of their value over the past couple of years, the company still has more than enough cash to operate, no debt, and a plan to produce in the future. Furthermore, as is almost always the case when something negative happens to a company, the investment community has likely overreacted and pushed the stock down so that it trades at less than $0.50 per estimated silver equivalent ounce, or just $0.20 per silver equivalent ounce with the company's $30 million in cash and equivalents backed out. This in itself makes the stock extremely compelling. In this article, I'll have a closer look at Golden Minerals (AUMN), which recently suspended production at its Mexican silver mine due to the low silver prices. I will discuss its main projects in brief and try to determine which silver price the company needs to re-open its Velardena silver mine. The company is listed on the NYSE MKT and the Toronto Stock Exchange. As there's plenty of volume on the NYSE-listing, I'd recommend to trade in Golden Minerals there. Golden Minerals had a very rough year as its market capitalization tumbled from in excess of $300M to its current level (and lost about 25% of its market cap last week), so the company could be interesting for the so-called bottom-fishers who believe in a higher silver price from here on. As I'll point out in this article, Golden Minerals might have some problems to re-open its Velardena silver mine in Mexico even though the silver price has slightly recovered to the current price of $24/oz. The company currently plans to mine the high-grade ore shoots first, but I think this is just a short-sighted temporary solution and makes things worse in the long run. The company's El Quevar project contains in excess of 60 million ounces of high-grade silver and the mineralization is still open laterally and down dip. Unfortunately this project is located in Argentina, and although El Quevar is in the very mining-friendly Salta province, it's difficult to attribute a certain value to this project as there aren't a lot of peers down there whose projects are decently valued by the market. Golden Minerals took a beating, but isn't dead, as the current share price might encourage another mining firm to acquire the company. This is absolutely not unthinkable, as it's entirely possible a larger producer has more in-house technical expertise to make the Velardena mine profitable. Golden Minerals owns 100% of the Velardena silver mine in Mexico's Durango state. The mine was operating at a production rate of approximately 400-500,000 ounces of silver and about 5,000 ounces of gold per annum when Golden Minerals decided to shut the mine down because of the low silver and gold prices. As the company has put the mine on care and maintenance, Golden Minerals will be able to maintain its relatively healthy cash and working capital position whilst the operating team is working on a new mine plan and the re-engineering of the current production and mining process. The average grade at Velardena is very high with a measured and indicated resource base containing in excess of 6 ounces per ton of silver and 3.45g/t of gold. This results in a rock value of almost $300/tonne, which is something most mining companies could only dream about. As the company discovered ore shoots with a higher average grade than the overall resource estimate, it would make sense to develop a mine plan to mine these high grade shoots first and hope the commodity prices will increase again. In my opinion, developing the high-grade ore shoots is just a temporary solution, as the company will have to replace the ore it mines or it will face a much lower overall grade after these shoots are mined out. So by extracting ore from these shoots Golden Minerals would just be able to buy some time, but this definitely isn't a long-term solution. As the company had a negative $6.7M operating margin in the first half of this year, I think the situation is worse than one could imagine. I admit the numbers are a bit unreliable as the company didn't produce for the entire six months, but when I look at the Q1 numbers wherein Golden Minerals produced 151,000 ounces of silver and 1,300 ounces of gold, it becomes clear the company's cash cost to operate the Velardena mine is extremely high. The company was aiming to reach the break-even status at a gold price of $1,600/oz and a silver price of $30/oz, so the project was losing a lot of money after the Q2 crash of the precious metals prices. It's however absolutely possible a more senior producer with more technical expertise sees another way to make the Velardena project viable (we have seen such moves before, for instance when Endeavour Silver acquired Aurico's El Cubo project and implemented a completely new strategy on the asset). 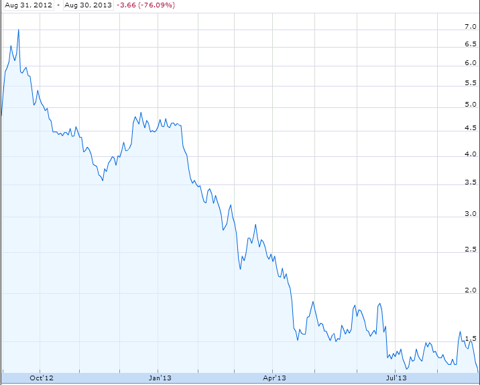 As the current share price of Golden Minerals is quite depressed (understatement! ), it would be easy for another company to negotiate a deal with the current management or simply to go hostile. 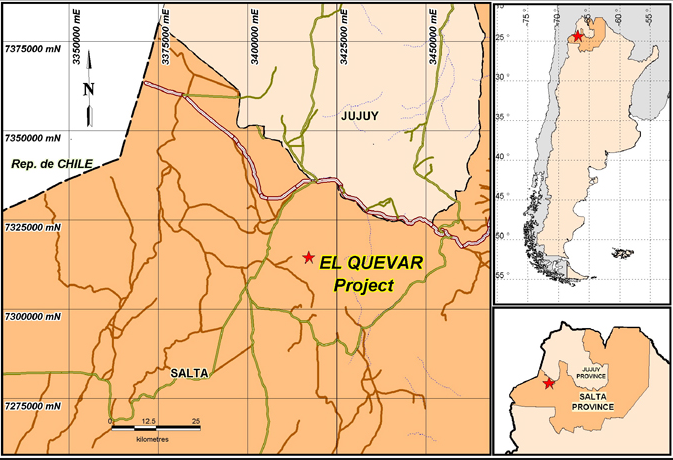 Golden Minerals also owns the El Quevar silver project, an advanced-stage exploration project in the Salta province of Argentina, which contains in excess of 62 million ounces of silver at an average grade of 4.5-5 ounces of silver per tonne. This resource estimate was based on just 270 drill holes, and the company has completed an additional 140 holes since this resource estimate, so I'm quite certain the effective resources at El Quevar will increase considerably and could be around 80-90 million silver-equivalent ounces right now as the deposit is still open down dip and laterally. The El Quevar project consists of 55,000 hectares and the current resource estimate was compiled after drilling 410 holes for in excess of 100,000 drilled meters. The company has also completed a 1,250 meter underground exploration drift at the eastern zone of the project to conduct underground exploration and drilling as it's likely the El Quevar project will be mined as both an open pit mine and a bulk mining underground mine. 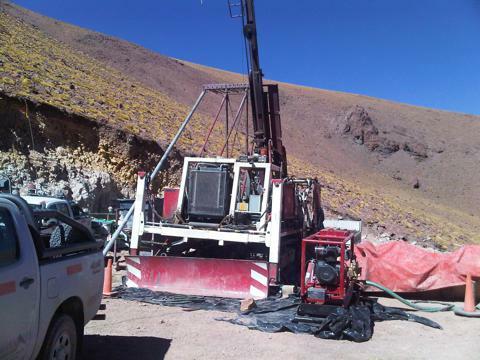 I've got the impression the company is learning how difficult it is to operate a mine and after struggling at Velardena, Golden Minerals seems to be initiating a new approach as the company is looking for a joint venture partner for the El Quevar project. It will be an interesting case to see which companies are interested in investing in Argentina after Pan American Silver (PAAS) ran into problems with its La Navidad project last year. Fortunately for Golden Minerals, it's not the federal government but the local states who have the prerogative about mining permits and licenses, and the Salta Province is one of the most mining-friendly states in Argentina. The question is now what valuation I should give this project, as there are no specific peers to compare with. If I'd use a completely arbitrary $1/oz in the ground, the project should be valued at approximately $60M. But this is just an arbitrary number, as for instance fellow explorers Golden Arrow Resources (GARWF.PK) and Mirasol Resources are trading at much lower Enterprise Value/ounces multiples (thanks to both companies' excellent working capital positions). This statement might be confusing but is very simple to explain. If we use Golden Arrow Resources as an example, the company has a market capitalization of $10M, but also has $8.5M in working capital and no debt, which means its silver project containing in excess of 100M silver-equivalent ounces is valued at just $1.5M. It's obvious these valuations are abnormal, and cannot be used as peer comparison for Golden Minerals' El Quevar project, so it's difficult to extrapolate abnormal valuations on Golden Minerals. The El Quevar project could be of interest to some major mining companies such as Silver Standard Resources (SSRI) and Pan American Silver , but I think most seniors will hold off until they are sure the project has about 100 million ounces of silver in a NI43-compliant resource estimate. It would be possible to attract one of these senior players to sign an earn-in agreement on El Quevar, so I'm looking forward to see some updates on the progress being made to date. In this paragraph I'll glance briefly at the balance sheet. At the end of Q2 this year, Golden Minerals had a working capital of $24.2M and $30M in cash. The book value took a big hit as the company chose to write down the value of its Velardena asset by $211.6M, which results in an updated book value of the property of just $27.6M. This huge impairment seems to indicate the company does not believe the Velardena property will be up and running (profitable) anytime soon. These impairment charges reduced the book value of Golden Minerals to just $62.3M, or $1.44/share, which seems to be a realistic value for its working capital position and assets in this era. Will/Should the management team take a pay cut? As operations have come to a screeching halt, I think it'd be fair if the management team accepted pay cuts as well. As the CEO earns a base salary of $450,000 and two of its Vice-Presidents have a paycheck larger than $200,000/ year (excluding compensation in shares and an additional compensation of in excess of $8000/year on 401(k)-plans and life insurance), I would like to see those salaries being cut to preserve cash. I have nothing against a good salary when everything is on a roll, but when you have to close your only producing mine it would make sense to cut some expenses at the corporate headquarters as well. At this moment I'd value the Velardena project + the mining and processing equipment at $25M, as I do believe a more experienced team could tackle the current problems by looking at a different angle at the project. If I value the El Quevar project at $1/oz of silver in the ground, the Argentinean project should be worth approximately $60M. If you add the current working capital position of $24M and deduct a $15M cost to keep the asset on care and maintenance for the next 18 months, the sum of the parts of Golden Minerals is approximately $95M or $2.20/share. This obviously assumes the Velardena Project isn't completely worthless at this point. The real value of the company will be unlocked by signing a favorable joint venture agreement (or sale) on El Quevar, and the sale of the Velardena project IF an interested buyer shows up. The sum of Golden Minerals' parts seems to be worth more than the current market cap. It's really worrisome the company is unable to operate an extremely high-grade project such as the Velardena Mine profitably. Golden Minerals is re-vamping its mine plan, but mining the high-grade ore first will only be a temporary solution and I'm afraid the management team is currently relatively short-sighted. Instead of targeting the ore shoots, the company should hold its entire flow sheet and production process against the light in order to find a SUSTAINABLE solution. 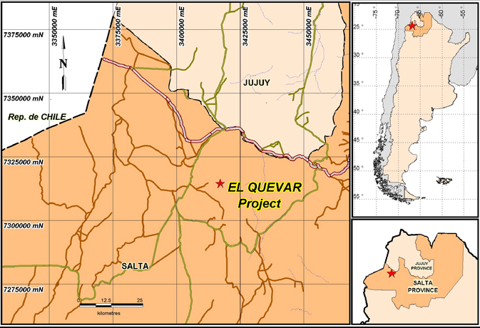 I like the El Quevar silver project in Argentina, and I agree with the plan to attract a joint venture partner who might be able to fund further exploration steps. Golden Minerals has drilled approximately 100,000 meters and has outlined a nice resource estimate, but at this moment in time I think bringing in an experienced joint venture partner might be a golden move to further advance this project. I currently have no position in Golden Minerals as I prefer the 'wait-and-see' method at this point. I would like to see a new conceptual mine plan for Velardena which does not solely focus on the high-grade ore shoots. Sandro et Marie, j'espère que vous avez vendu cette daube hein ! Non mais sans blague, depuis son point bas de fin juin l'or et l'argent ont rebondi de 17% et 32% ... et AUMN a fait quoi ? -15% !! La tres grande majorité des minières de qualité ont surperformé les métaux sur ce rebond, je vous ai mis deux exemples ci dessous. NEW YORK, Sept. 11, 2013 /PRNewswire/ -- Levi & Korsinsky, LLP is investigating Golden Minerals Company (NYSE MKT: AUMN) in connection with possible claims of breaches of fiduciary duty. To get more information, click here: http://zlk.9nl.com/golden-minerals-aumn/. There is no cost or obligation to you. If you own common stock in Golden Minerals Company and wish to obtain additional information, please contact Eduard Korsinsky, Esq. either via email at ek@zlk.com or by telephone at (212) 363-7500, toll-free: (877) 363-5972, or visit http://zlk.9nl.com/golden-minerals-aumn/. Levi & Korsinsky is a national firm with offices in New York, New Jersey, and Washington D.C. The firm has extensive expertise in prosecuting securities litigation involving financial fraud, representing investors throughout the nation in securities and shareholder lawsuits. The attorneys at Levi & Korsinsky have been appointed by numerous courts throughout the country to serve as lead counsel on behalf of shareholders in major securities lawsuits and have successfully recovered multimillion-dollar damages awards on behalf of investors. For more information, please feel free to contact any of the attorneys listed below. Attorney advertising. Prior results do not guarantee similar outcomes. C'est ( enfin c'était) le plus grosse ligne de Bill Murphy, le fondateur du GATA, grand connaisseur des mines et du marché s'il en est. J'ai, moi même une ligne importante de cette daubasse qui ne cesse de décevoir; alors, certes, la terrible et ample correction (qui je crois s'est enfin terminée) a eu un effet superlatif sur des comptes qui supportaient de lourds investissements infrastructurels en même temps qu'une coûteuse campagne de forages. Les réserves en terre sont pharaoniques et c'est la raison qui nous a amenés sur ce titre. Je ne saurais dire si c'est la conjonction d'une trésorerie tendue au pire moment qui a précipité AUMN dans les abysses ou si c'est une question d'incompétence, ou pire, de malhonnêteté; une chose est certaine, prendre une telle perte ne peut se concevoir que sous l'angle fioscal pour extérioriser une ùmoins value, encore faut-il etre en plus value sur les autres lignes pour justifier la démarche. Bref, je dois à l'honnêteté de reconnaître que je partage votre déception et votre écœurement....seul un rebond massif (envisageable) et durable du métal permettrait de se refaire, et encore, sans doute seulement partiellement. Je suis particulièrement affecté de devoir assumer ma responsabilité car je n'ignore pas que c'est moi qui, en toute bonne foi, ai conseillé l'achat d'ECU que vous ne seriez sans doute pas allé chercher tout seul, vous m'en voyez sincèrement consterné et honteux. J'espère que mes conseils sur RGLD, SLW, HL et CDE que je privilégie à court et plus long terme , j'ai bon espoir sur SVM. J'espère que ces quelques lignes vous auront apporté un peu de réconfort et je vous réitère mon engagement à toujours tenter de fournir des analyses sincères. Alors pas d’œuf au riz, mais c'est toujours mieux que l'inverse....on est plus trop habitué en plus. Il est super ton lien, y aurait-il moyen de nous faire un tuto dans le forum intitulé "liens utiles" sitipli ? Merci pour les liens et je souhaite les meilleurs voeux possibles à tous. Quelle différence entre short ratio (13,7%) et float short (7%) ? The short ratio (or short interest ratio, SIR) for a public company is a metric signaling prevailing investors' sentiment. The ratio is calculated by dividing the number of shares sold short by the average daily trading volume, generally over the last 30 trading days. The ratio represents the number of days it takes short sellers on average to repurchase all the borrowed shares. The ratio is used by both fundamental and technical traders to identify trends. Percentage of float is how many shares have been sold short as a percentage of how many shares are trading on the open market. Float is total shares outstanding minus any restricted shares. The Company has adopted a different arrangement with respect to long-term compensation awards for executives that would typically have been granted in December 2013. The Company's practice has been to award restricted stock pursuant to the Company's 2009 Equity Incentive Plan (the "Plan") to the Company's principal executive officer, principal financial officer and named executive officers valued on the grant date at a multiple of the executive's then current salary, which in 2012 was 300% of current salary for the principal executive officer, and 150% of salary for the principal financial officer and named executive officers. On December 19, 2013, the Company made the following grants of restricted stock pursuant to the Plan, vesting ratably on the first, second and third anniversaries of the grant date: 105,000 shares for Jeffrey G. Clevenger (principal executive officer), 125,000 shares for Robert Vogels (principal financial officer), 125,000 shares for Warren Rehn (named executive officer) and 130,000 shares for Deborah Friedman (named executive officer). These restricted stock grants range in value on the grant date from $46,200 to $57,200, and represent a range of from 9.2% to 32.7% of current salary (before the temporary salary reduction referred to below) and 3.4% to 24.7% of the value of long-term incentive awards made in 2012. The grants made to each executive are in addition to grants previously made in connection with a June 1, 2013 temporary salary reduction. Please see the Company's Current Report on Form 8-K filed on May 28, 2013 for information regarding the previous grants. Also on December 19, 2013, the Company established a program under which awards of restricted stock pursuant to the Plan, or of units ("Units") pursuant to the Company's 2013 Key Employee Long-Term Incentive Plan ("KELTIP"), may be made to the four executives identified in the preceding paragraph based upon the achievement of performance against objectives established by the Company's Compensation Committee of its Board of Directors. Awards will be based on the Compensation Committee's evaluation of performance against objectives and total awards granted under this program may range in value on the grant date(s) from 0% to 200% of the target award. The target awards have been reduced significantly from prior target awards and are based on multiples of base salary (before the temporary reduction), with the total target award for Mr. Clevenger at 100% of base salary, or $500,000, and the total target awards for the other executives at 50% of base salary, or $135,000 for Mr. Vogels, $140,000 for Mr. Rehn, and $87,500 for Ms. Friedman. Vesting and payout terms of the awards will be determined by the Compensation Committee when the awards are granted. The Company anticipates that awards, if any, made under this program will be made during 2014. Please see the Company's Current Report on Form 8-K filed on December 18, 2013 for information regarding the KELTIP.